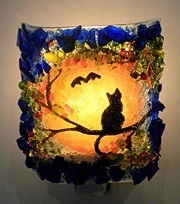 A unique Halloween lantern with a vintage style design created by Gina Marino of Mystical Enchantments. The Vintage Style Halloween lantern is created from a large amber, orange colored glass jar with a black metal lantern handle. 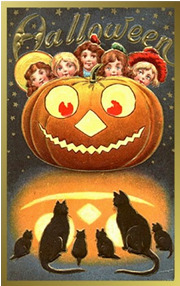 Imprinted on the front is a vintage style photo of a Halloween Black Cat that sits next to a Witch's broom and surrounded with orange Halloween pumpkins. There is also a text blurb on the front that states "For Ways that are dark, and tricks that are vain - Watch Out!". Some black diamond dust has been added around the photo to make it sparkle, and the lantern also comes with a tea light and a ribbon tied to the handle. This Vintage Style Halloween lantern measures about 5 and 1/2 inches high, 8 inches high when the handle is in the up position and measures about 4 inches in diameter. 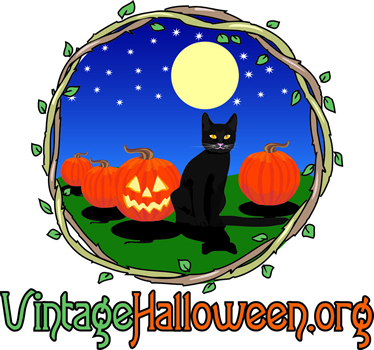 If you have any further questions about the Halloween lantern or if you would like to make a purchase, be sure to visit the Esty Shop page of the Vintage Style Halloween Lantern Black Cat and Pumpkins.